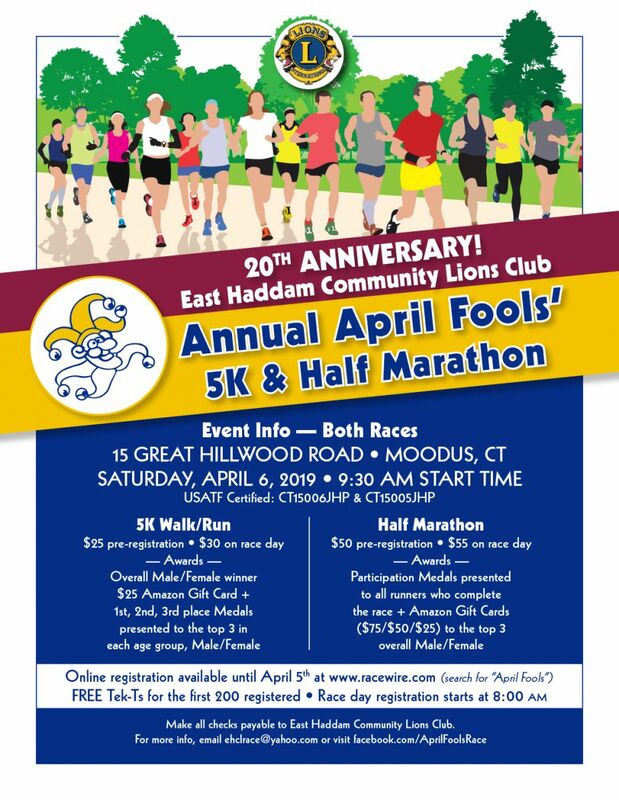 The East Haddam Community Lions Club holds its Annual April Fools Road Race on the First Saturday of April each year. The Courses have been professionally measured and certified. Bookmark this site so you'll know where to come for results, photos, and information about this popular event. The April Fools Road Race takes place within the Moodus section of the Town of East Haddam. Come check out this beautiful yet challenging course that is frequented by local families, running enthusiasts, and top level local runners. Walkers are welcome in the 5K race only. We also offer chip scoring, mile splits and water stops. Refreshments are available for runners before and after the event. An award ceremony will be held after each race. Trophies are awarded to the overall Male and Female runners in each race. Medals are awarded to the top 3 runners in each race category. All runners in the half marathon will be awarded medals. There is a free Children's Fun Run for children ages 7 and under. Register the morning of the race. The Fun Run begins right after the start of the regular races. Prizes will be awarded to all participants. Online registration and payment are available. Registration forms and payment can also be sent to EHCL Road Race, c/o Chris vanValkenburg, 54 Great Hillwood Road, Moodus, CT 06469. Make checks payable to East Haddam Community Lions Club Foundation (EHCLCF).